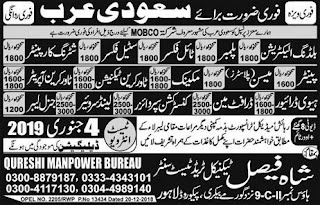 Below are the complete details of the Plumber jobs in Shah Faisal Technical Trade Test Center in Lahore. Skills Required for Job: Reading, drawings, and figures to understand the layout of water supply, waste, and venting systems. Installing, repairing and maintaining domestic, commercial, and industrial plumbing fixtures and systems. Qualification: Plumber Jobs in Saudi Arabia middle pass degree holders must have relevant of working experience in similar job & its a temporary basis male candidates may apply this posts. Plumber jobs in Shah Faisal Technical Trade Test Center Lahore, in Pakistan published on Paperpk.com from newspaper on December 29,2018. Job seekers who are already working as pipe fitter , senitory work , water fitting repair, Pipe Fitter, Pipe Fabricator can also apply for post of Plumber.